It was Friday, November the 12th, and I took the day off from work. I usually like to be in a tree stand during the second week of November, everyone knows what a magical time it can be. 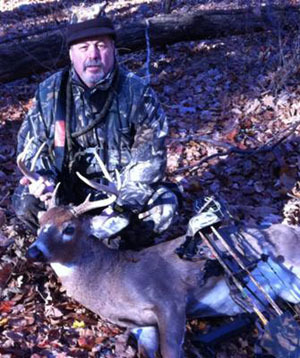 I live here in Westchester County, NY and enjoy hunting with my brother and our bow and arrows. The 2010 season hadn't been going so well for us. We both had opportunities early on, but had not connected yet. On our way to our tree stands, we laid down a scent trail and hoped that a buck would follow it to our stands. That morning was a beautiful day, sunny and cool, and we were in our stands well before daylight. While it was dark we had a deer around our stands. My brother and I were only about sixty yards apart, but couldn't make out what it was and eventually the deer walked off. We like to use two way radios while hunting for several reasons, but mostly just to help pass the time when things are slow. After first light, and around 7:21 am, we heard deer running along the ridge above us. I heard my brother on the radio say, "Deer running on the ridge." So I grabbed my grunt call and began grunting to the deer. To my surprise, the buck turned and headed right down to us. He was heading right to my brother on the scent trail we had laid down in the morning on our way in. I had given my brother some words of encouragement on the radio before the deer got close enough for him to draw his bow and shoot. I told him to take his time and wait for a good shot. The deer walked to about 15 yards and gave him a broadside shot, but to my surprise he missed and now the deer was heading in my direction. I could hear my brother on the radio, he was dumbfounded. He couldn't believe that he didn't make the shot. It seemed like forever before the deer approached my stand and into my shooting lan, when he did I came to full draw and sent a muzzy tipped carbon express arrow into his lungs. I watched as the deer only went about 45 yards stopped and tipped over. I could hear my brother on the radio after I shot asking if I had hit the deer, and I told him I just watched the deer go down. We gave him a little time and then gathered up our gear and walked over to the deer. When I looked at the 8-point buck, he had an unusual white patch of hair between his eyes (see photos), something that I have never seen before. He will make a nice mount and a welcomed addition for my trophy room. This was an exciting hunt for both my brother, and myself, because we were both given a chance at the same buck only minutes apart and I just happened to be the lucky one on this day!